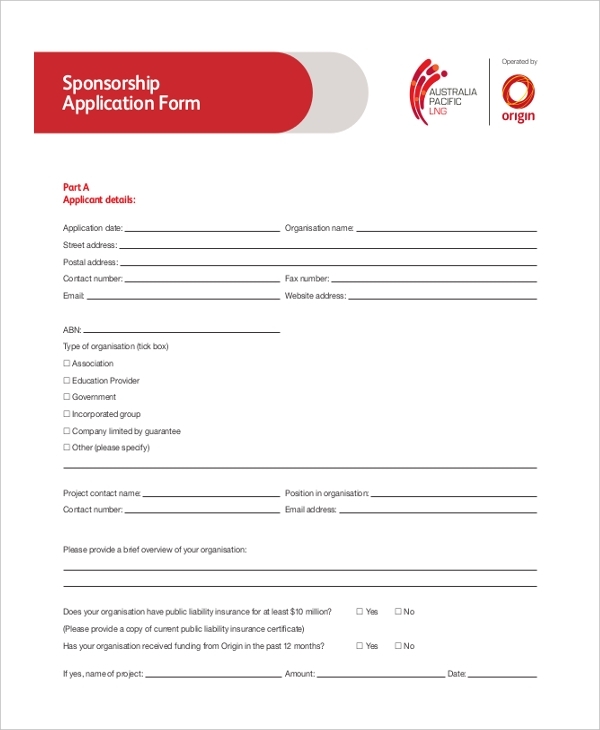 A sponsorship application form is a type of a form which is used to get sponsorship from various organizations. This form is widely used for getting every kind of sponsorship from various organizations. The form has been customized with the various details that are needed for getting sponsorships. A sponsorship is mainly needed for any type of event or social work. It is a form of price money that is offered in relation with the promotion of the company which is offering the money. This Application Form can be used to get any kind of sponsorship from various organizations. The form is acceptable at variable industry. The form is mainly used to get sponsorship from various organizations in relation to various events and social work. 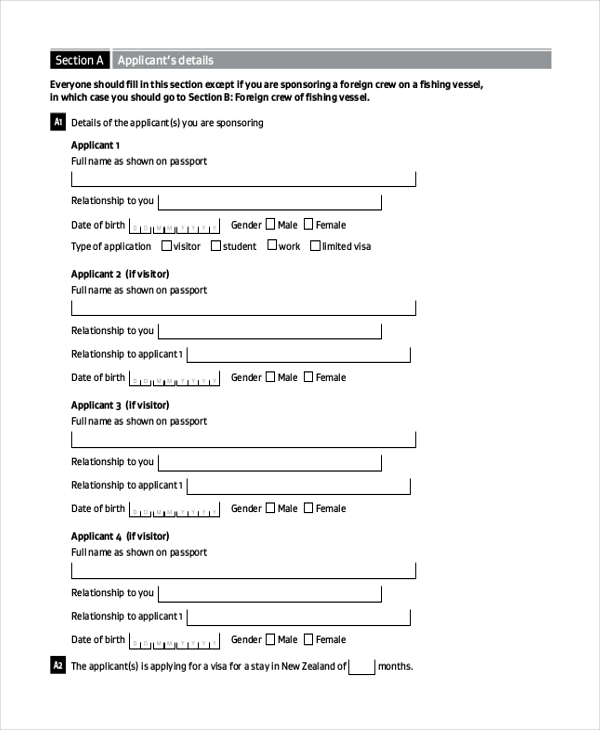 This form has been customized with every detail. The sponsorship is acquired by the assistance of this particular form and there are some related documents which need to be submitted in order to get a sponsorship. The form also support information related to a visitor visa, student visa or work visa. The form is mainly used for travel sponsorship. There are various organizations who give money for travel journey. The form can be submitted in order to get sponsorship on various travel events. All the details are highlighted in the form, which is thoroughly scrutinized by the sponsorers. The form can be sued at various organizations for getting the sponsorship amount. 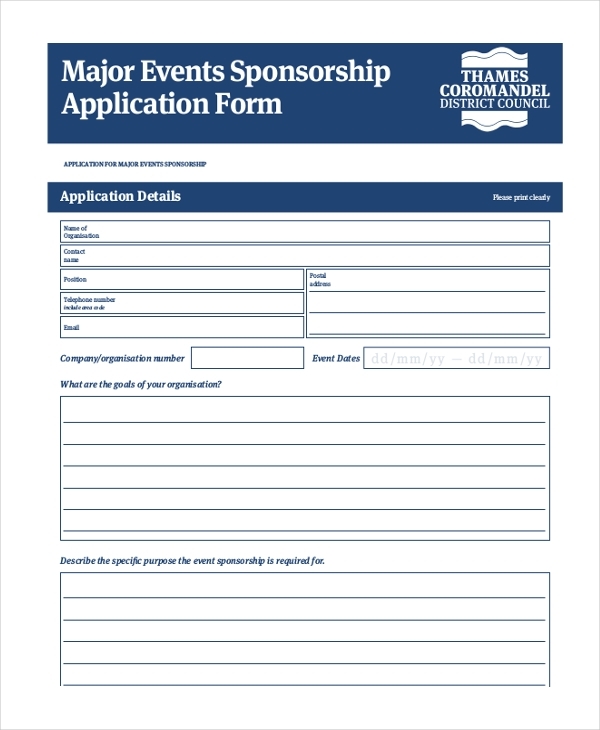 This application form is used by the Thompson Rivers University. 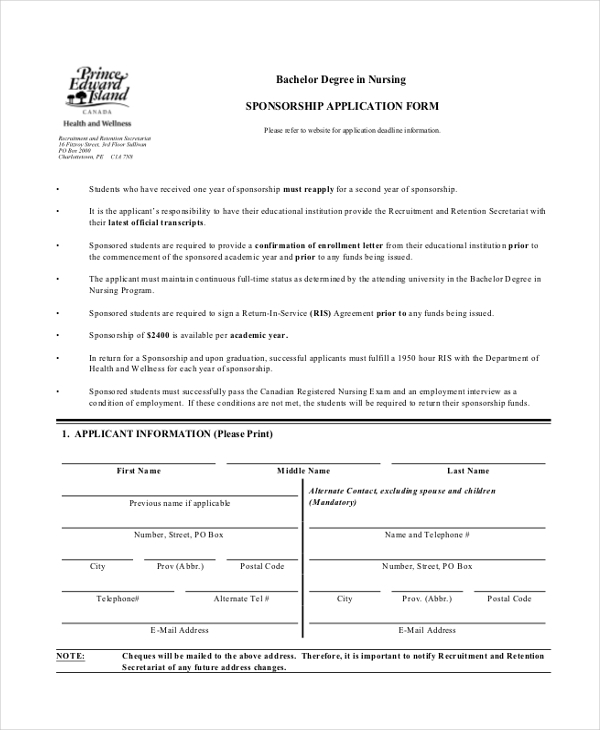 The form is mainly used to get sponsorship for tuition. The various details that are there in the form are the details of the sponsors, students’ details, information about the fees, and approval of the students. All the details are mandatory and then only the form gets approved. The form is mainly used for community sponsorship program. There occurs various events in a community for which sponsorship are needed. The form is used for getting every kind of sponsorship in a community based program. The acceptance of the form is broaden and mostly all the organizations accept it. 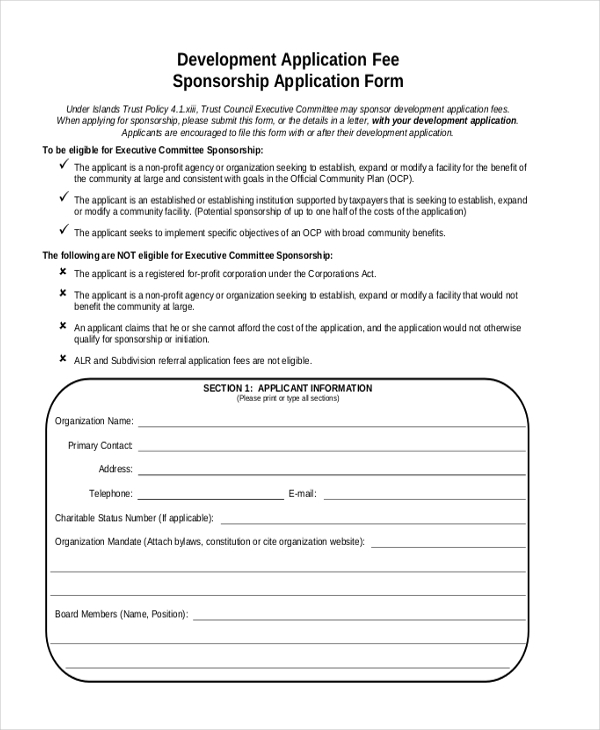 Sponsorship for any type of community program can be achieved through this form. 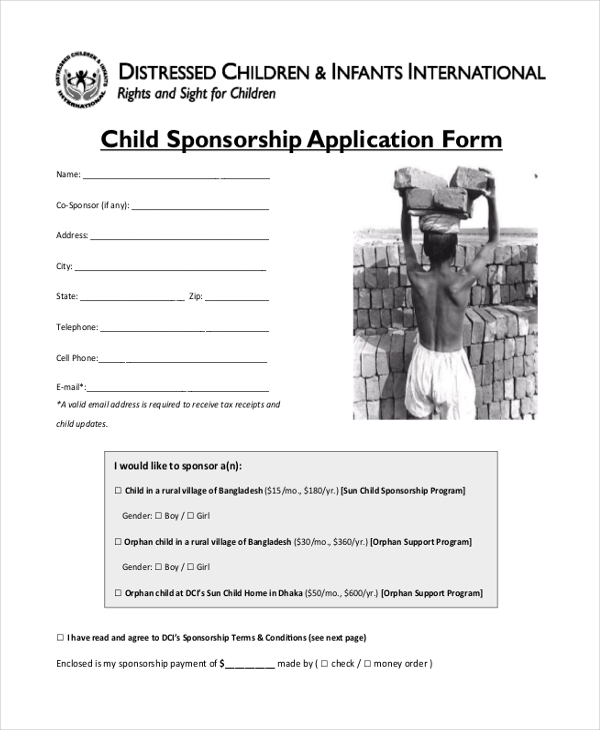 The form is mainly used to get sponsorship for the various distress and infants children. There are various organizations mostly NGO’s who are looking after all the little children who all are completely abandon from their own home. These organization gets sponsorship for various activities from different places by the assistance of the p[particular sponsorship form. The form is mainly used for bachelor degree courses. 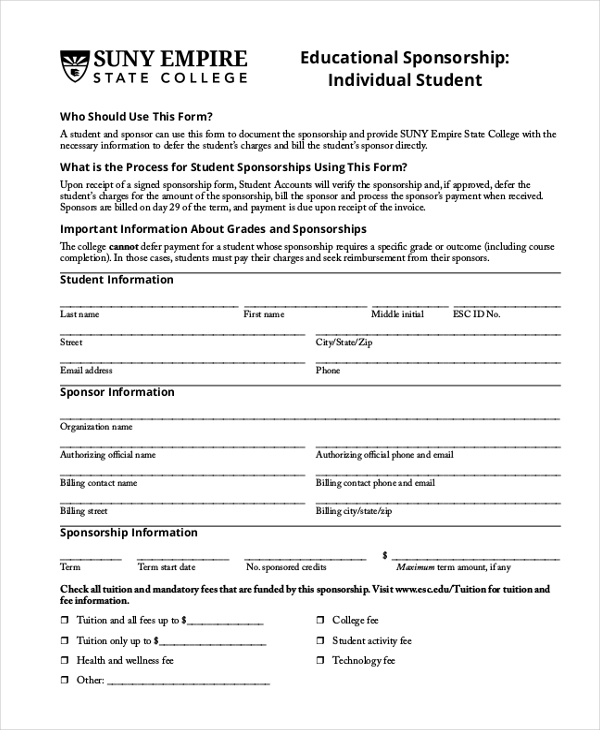 This form has been customized with all the information that is needed to give for a student sponsorship. The various details of the form are information of the student, academic information, type of sponsorship and the residence status. The form is mainly used for corporate donations and sponsorship. All the corporate donate capital value as a part of their corporate philanthropy. 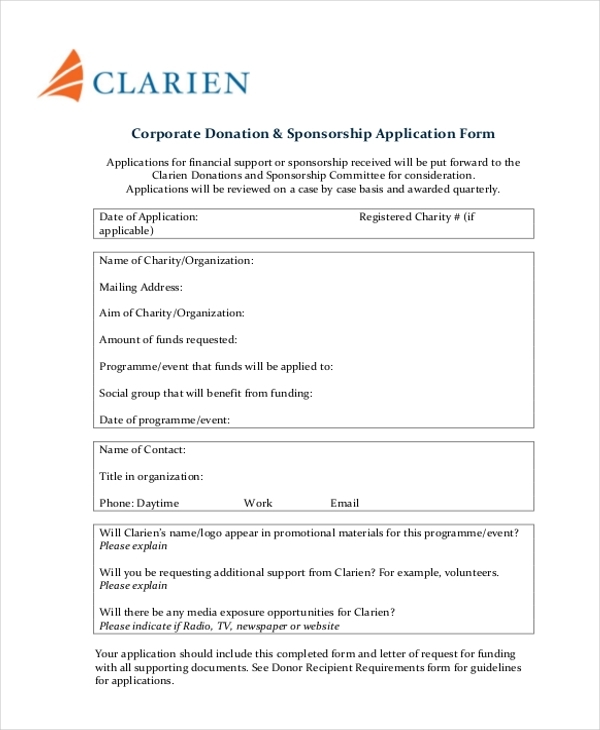 This form is used by various corporate houses for sponsorship and donation purpose. This form is used mainly for getting sponsorship for sports. 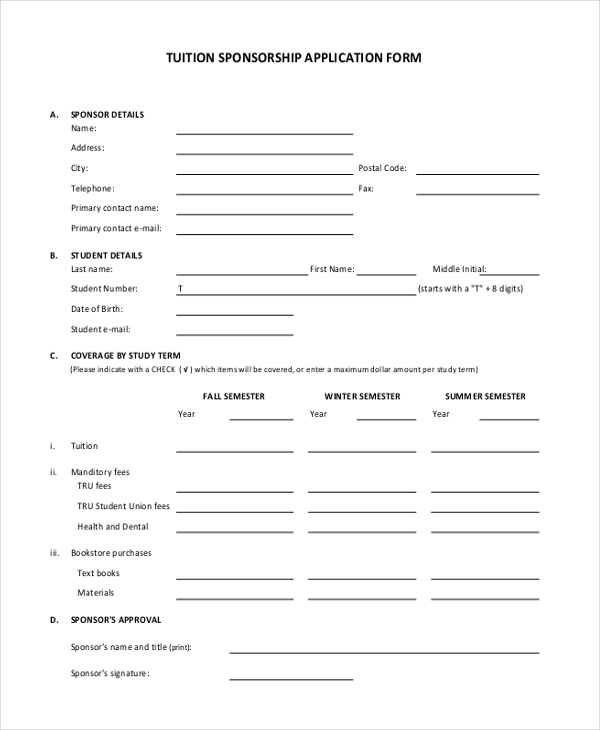 Every applicant needs to submit this form in order to get a sponsorship on sports. The form has been customized with various details of the sports sponsorship. The form even highlights all the terms and condition of getting a sponsorship on sports. The form is mainly used to get sponsorship for various major events. All the big events need sponsorship from various organizations. This particular form can be used by the event organizers to gather sponsorship form various industries. The form is mainly used for application fee for development. The form has been divided into various subsections like applicant information, development application information and declaration by the individual. 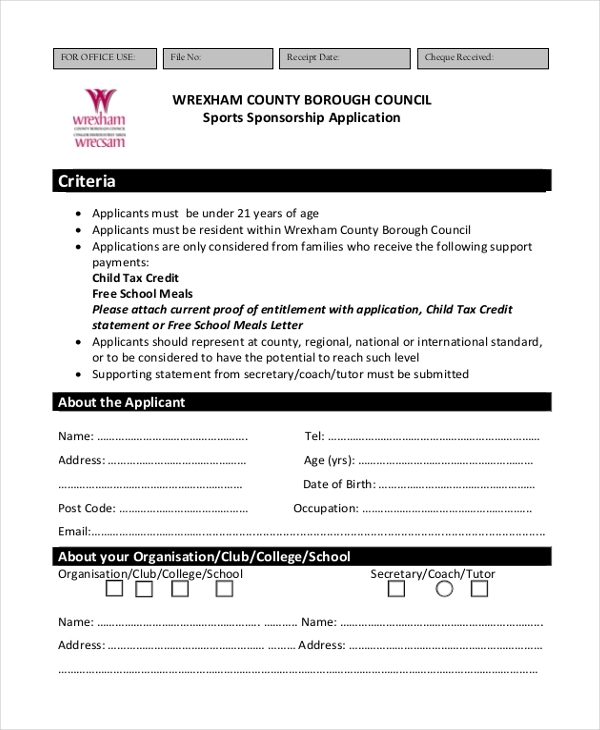 What is a Sponsorship Application Form? The form helps in proper documentation of a proposal. All the proposal details are duly mentioned in the form for any kind of project. The form is considered as the official document for proposal at varied industry. The target audience of this particular form is all those people who demand a sponsorship for any kind of events or some cause. 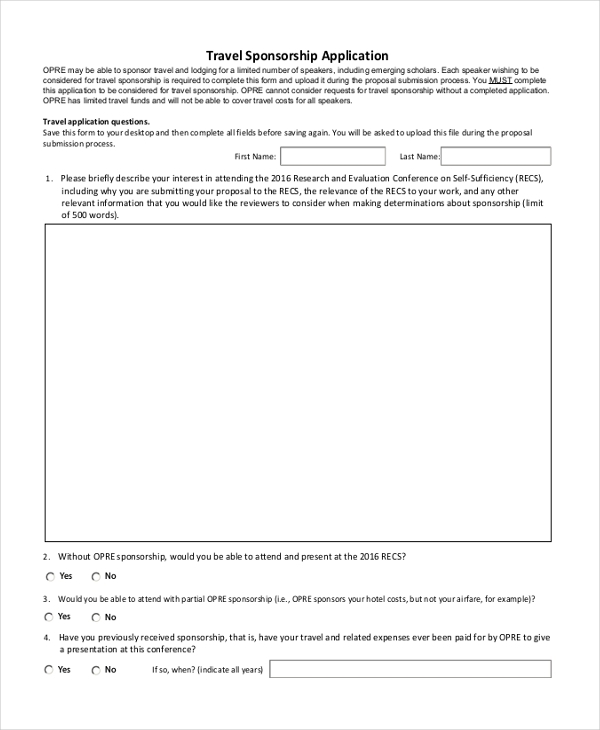 This form can be used for getting the sponsorship from various organizations. Many people are using the form for getting sponsorships from various organizations for variable events. The form is used for getting sponsorships from various organizations. The form has been customized with all the details that are needed for getting sponsorship. All the organizations accept this form as a part of giving sponsorships to people. The form has been customized with every detail that is necessary for getting a sponsorship from organization. The form has got a huge demand in the market right now. Every kind of sponsorship can get clear through this form.